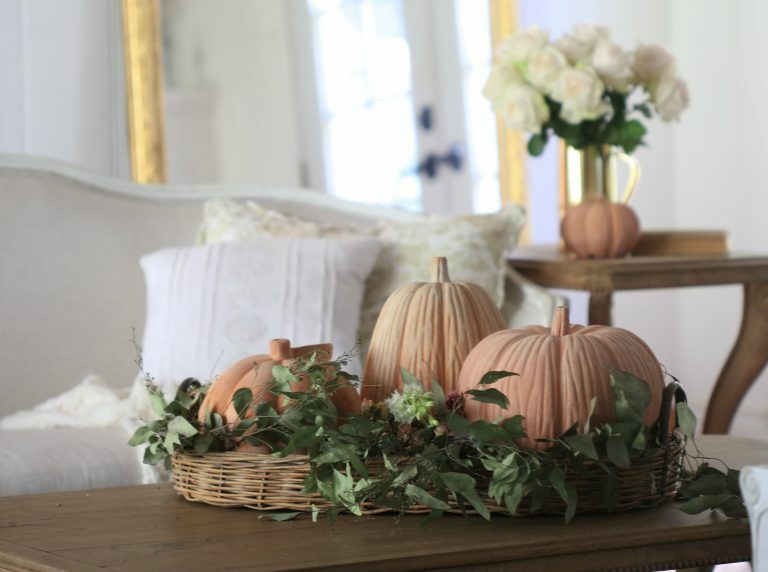 Simple little touches of autumn are my favorite. and today it is all about a closer look at the living room. I am big on ambiance. and I am a happy camper. In the living room- I keep it fairly simple. 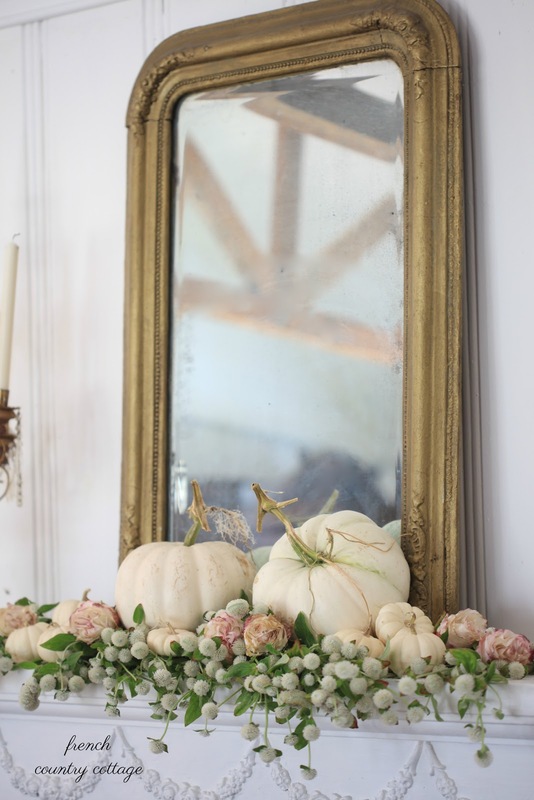 and mantel decor and that is about it. I will share a closer look soon. 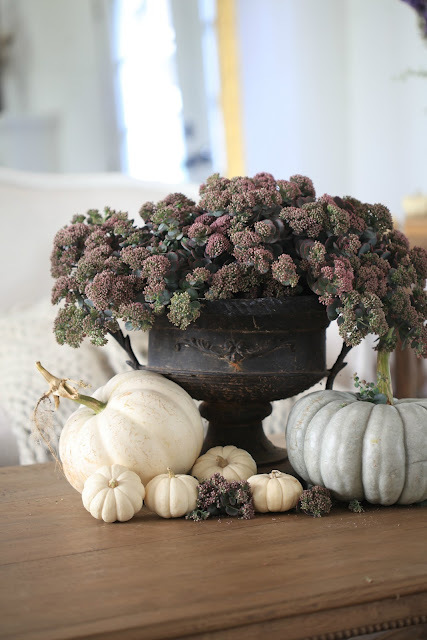 was Sedum Autumn Joy- thank you! 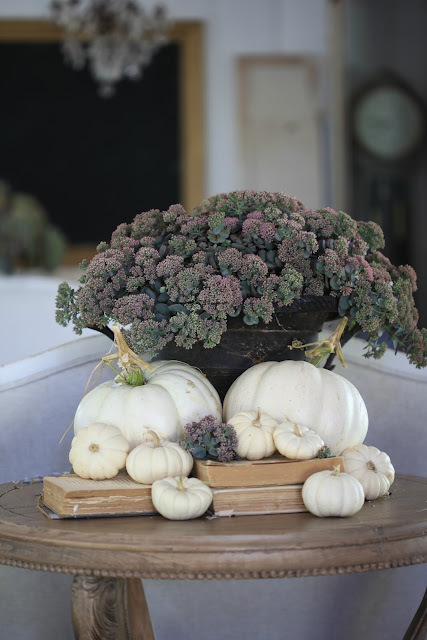 I love the texture this plant has- and how charming it is inside the house in a rusty crusty urn. It speaks simple natural autumn to me. and filled it with candles for a bit of that ambiance and glow. in my porch post coming your way. that urn and sedum moved. I have to say, I am kind of loving it here even more. and the secret those pumpkins have. I do love that floral on your cocktail table, it is all very pretty as always! I do love that sedum. Is it alive or dried? It is a potted plant-absolutely amazing!! I am in love with it. Beautiful Courtney! I love how romantic all of your pumpkins look. They are magical! 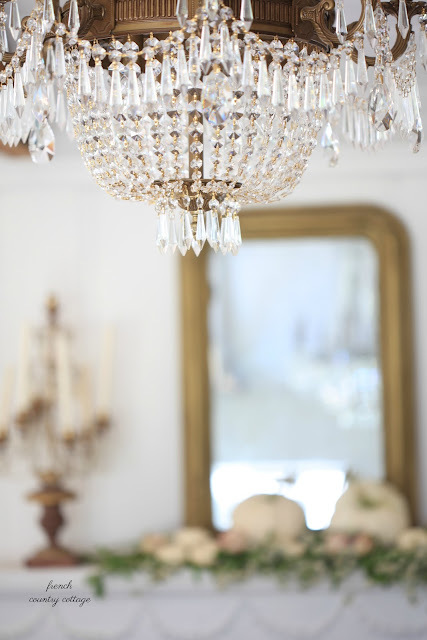 Where is that chandelier from? I found it at Wayfair. Hi Courtney, your vignettes are so beautiful and elegant. It all says "Autumn Time". Thank you Jo! Have a beautiful day as well! I am loving the gomphrena and sedum - they have an investing look and texture that go well with those white pumpkins, don't they? Everything looks so beautiful. 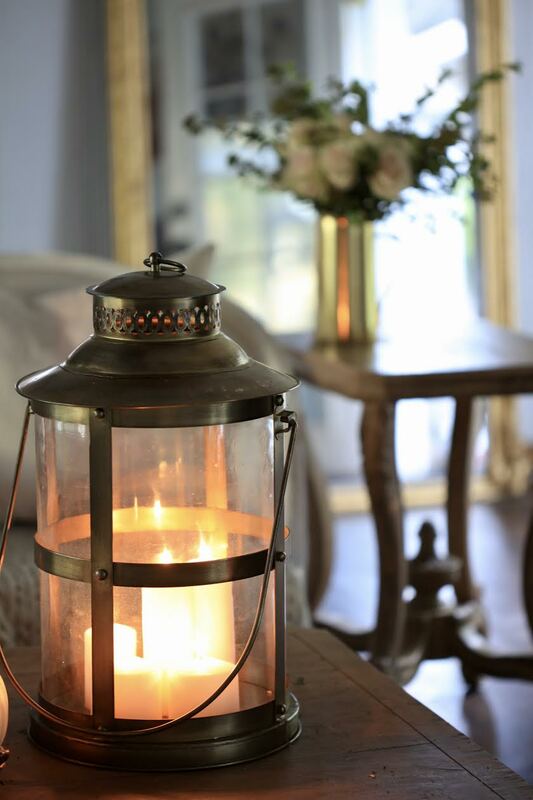 I love the lantern what you brought in. 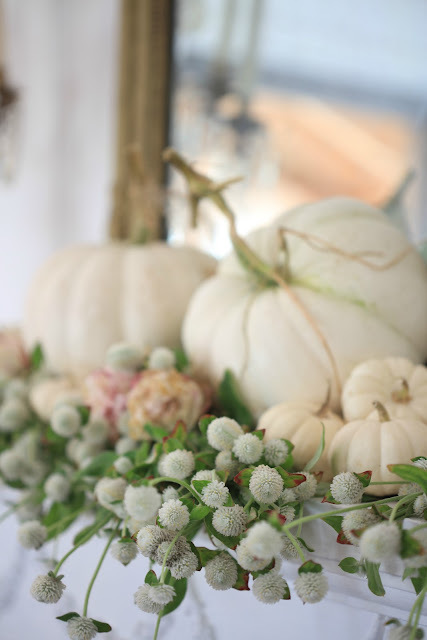 I really like the look of all the white pumpkins. Are they real? I know there is such a thing but I've never seen any in person. The mantle is gorgeous! I am dying to have a mantle in my little living room. Problem is where to put it. I have a large bay window on one wall and a large, upright piano on another. The third wall has the TV on it and the forth a large opening into the dining area. See what I mean? I enjoy your lovely posts. I am remembering the Christmas ones from last year and those gorgeous pale, pale pink ornaments. Yum! I love it. I have Autumn Joy Sedum and it never bloomed. I moved it and it's bloomed the last two years. I love it as a house plant. As always, your look is flawless. It's 95 in Texas this week so I'm holding off on decorating a bit. 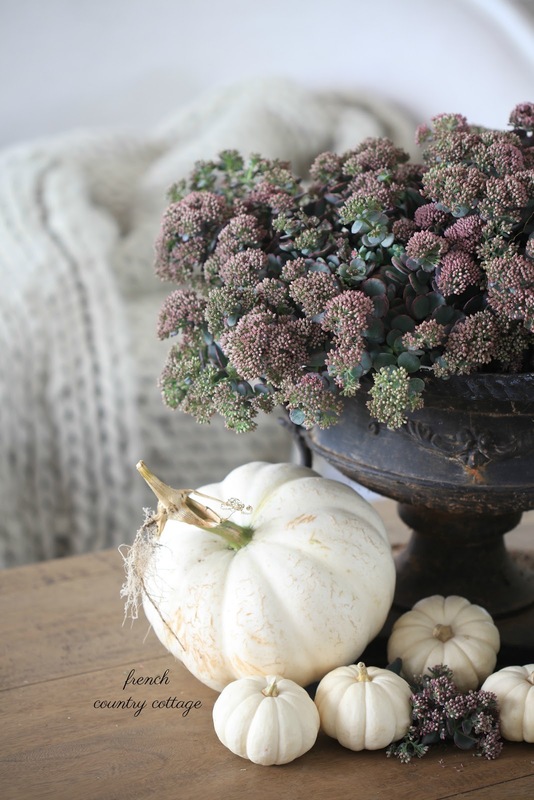 I think the Sedum Autumn Joy is now my fav Fall plant...I just bought one at the grocery store of all places...Just love the mantel with the elegance of nature's beauty!